You've probably heard the phrase "You can't out-train a poor diet". While everyone has their own opinion on what a "poor diet" looks like, the concept remains: no matter how many hours you spend at the gym, you will not achieve your dream body without fueling yourself properly. Learning how and when to eat to optimize muscle recovery and fat loss, however, can be pretty complex. First, let's look at the numbers and see how easy it can be to "out-eat" a good workout. Do these numbers surprise you? How about knowing that just 1 medium order of boneless wings would require running at least 10 MILES to burn off?? 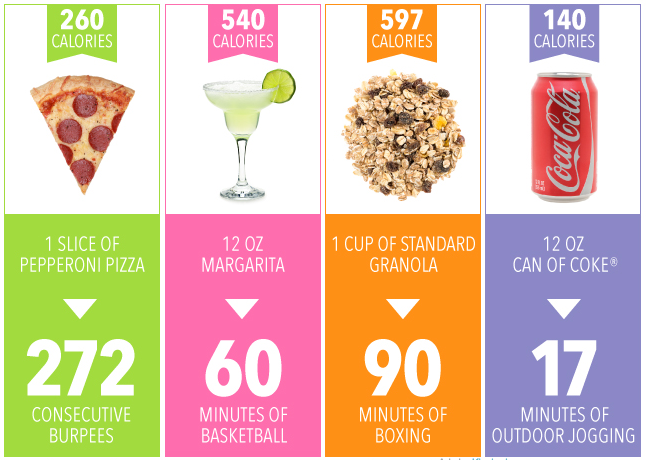 As you can see, it takes our bodies a heck of a lot longer to utilize calories than it does to consume them. However, we also want to focus on the quality of the food we consume, since body composition is much more elaborate than simply comparing calories in vs. calories out. Think of the last time you ate something calorie dense that had little nutritional value. If you are unsure, here are some of the symptoms you may have experienced: sluggishness for hours after eating, bloating or GI discomfort, lack of motivation to workout, and cravings for junk food later in the day. If you're experiencing one or more of these symptoms on a daily basis, you cannot achieve your full potential of wellness and your workouts are more than likely suffering. The diagram below illustrates the vicious cycle of eating poorly and how that affects our workouts, mood, and motivation for reaching our goals. A lot of times we don't know how good we are capable of feeling until we adopt a consistent healthy eating routine that makes us feel GREAT every day. In doing so, we need to focus on the quality of the calories as well, not just the number. Once you start fueling your body properly with a balanced amount of protein, carbohydrates, and fat, you will be able to push yourself harder in workouts, feel more energized throughout the day, and finally see the results you've been looking for. In order to maximize your results from exercising, it is important to not only focus on what you eat, but when you eat. A lot of diet trends will tell you to eat every 2-3 hours to prevent hunger. While this works great for some individuals, others may actually experience weight gain, since eating frequently can lead to consuming more calories total throughout the day. A more effective way to time your meals/snacks is through intuitive eating, listening to your body and only eating when you're hungry. This comes with one exception: eating after workouts. Exercising can actually decrease hunger (another benefit!) by regulating the hormones that affect your appetite. However, whether you feel hungry after a workout or not, it is incredibly important to eat within an hour of finishing your workout to prevent muscle breakdown, promote muscle recovery, and increase fat loss. As you can see, there are a lot of components to keep in mind when eating well and maximizing your results from exercise. Filtering through all of the conflicting "health tips" and fad diets online can be confusing and a waste of time. An ideal balance of carbohydrates, protein, and fat consumption is different for every person, which is why most cookie-cutter diet programs are not effective long-term. This is also why it is so essential to talk to a wellness professional to discover an eating routine that will optimize your muscle recovery, fat loss, and make every workout count. At All-Inspired Wellness, we will develop a plan that works best for you, providing results you see and feel immediately, but that also last for years to come. Are you All-In?